while soaking up the sweet calming energy. All this while helping others! 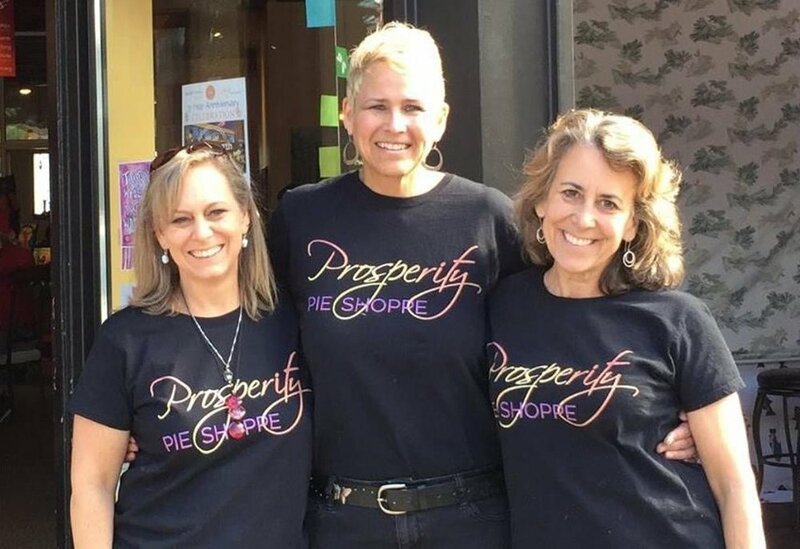 Located within Sacred Money Studios, the profits from the pie shop fuel the studio’s mission of providing a second chance to women reentering from incarceration and provides access to financial education classes for the community. Visit the pie shoppe for a handcrafted latte, a piece of pie or quiche, a glass of wine or beer. On summer evenings you can enjoy your pie outdoors, while listening to live music. Check out our menu or order some takeout! below for a calendar of upcoming performers. do an improv, tell a tall tale. Sign up at 6:15, starts at 6:30. Our classroom is perfect for your workshop or party. Or you can rent our entire cafe for your corporate event. Please read through our guidelines and submit your request through our online form. We would love to host you! contact us about Playing at the Pie shoppe. Three women, three sons, three years since we opened— it’s been quite a journey! In 2015 we had a dream of creating a sacred space for community to flourish, have deep conversations and build lasting friendships. Nine intense months later we opened our doors, and have been at it ever since.